Summertime is here and summertime means swimsuit season. Last summer saw my two favorite swimsuits dissolve into a heap of old elastic and chlorine after several years of ownership. Since one cannot have just one swimsuit, it was determined that at least one more was required. Swimsuits can be surprisingly expensive. And as much as I am not a fan of some their business practices, in my years of trial and error, Wal-Mart has one of the best ‘price point to quality’ ratio for swimsuits, especially for us ladies not shopping at Forever 21, or some such. I got two super-cute, vintage-styled, classy-patterned adorable swimsuits for what it would have cost me for one swimsuit online or at a boutique. I never quite find what I’m looking for at Target, but Wal-Mart’s Catalina brand is pretty solid with great support fabrics. Just my two cents. Trying on bathing suits isn’t a traumatic experience for me. It is what it is. I will say that maybe eating lunch at Chipotle wasn’t the best thing to do right before driving deep into the Valley to find a Wal-Mart and try on bathing suits. All that being said, let me get to today’s post! 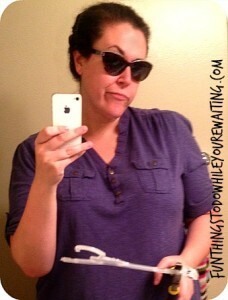 I recently came into some cheap, plastic, bathing- suit hangers (see! context!). And although I guess I could re-purpose it by using it to hang my swimsuits in the closet, I prefer my suits in a drawer. And although I could also have repurposed these hangers as pant hangers, (heh, pant…) I’m kind of picky about all of my hangers being uniform. I know. I’m ridiculous. 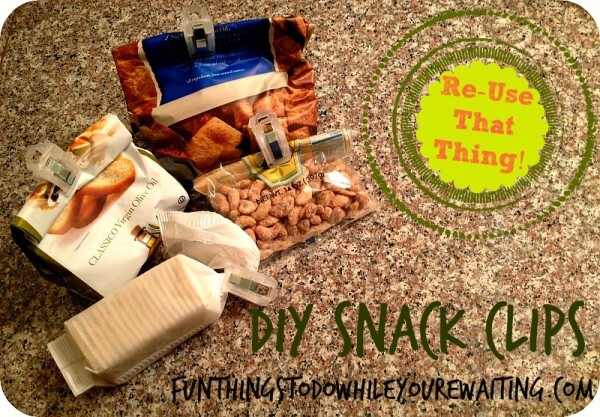 That being said, I have had a pin pinned on Pinterest (so many “pins”… It’s like googling google or tweeting on twitter) since the early days titled, “Hanger to Chip Clip.” Having tossed a ton of cheap, plastic hangers in the past, this seemed like such a great idea… especially since I am always in need of Snack Clips and love up-cycling. The pin took me to an awesome site (reuseandupcycle.blogspot.com that collects really smart up-cycling ideas from around the internet. Have I mentioned that I love re- and up-cycling things? In my search to provide as much internet provenance as possible, the aforementioned site Reduce, Reuse, UPcycle! pointed me to the “original” source: Crafting in the Rain… which subsequently, is also a great site for upcycled and crafty projects. The original instructions were to take some gardening shears and cut the clips from the hangers-or break them by hand if no shears were had. Next, a lighter was suggested to melt any remaining sharp edges. I didn’t have garden sheers, but I did have a really nice cable cutting tool. Thanks, internet/cable installer who accidently left them behind two apartments ago. And, just like all projects, it was simple because I had the right tools. Seriously. Super easy. 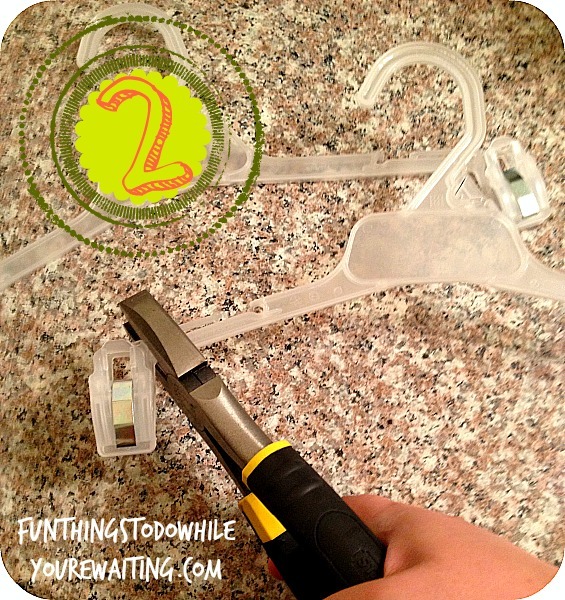 Step two: Snip clip from hanger with appropriate tool. Since it’s sharp plastic, I used safety glasses (a.k.a. my sunglasses*) to mitigate as many shards to the eye as possible. Step three: Use clips on everything in the pantry. I found that I could cut any sharp edges off the clips with my cable cutter, mitigating my need to use the lighter. These hanger clips actually clip better than some store-bought chip clips I have. Chip clip. Clip, clip, clip. Again, so many of something! 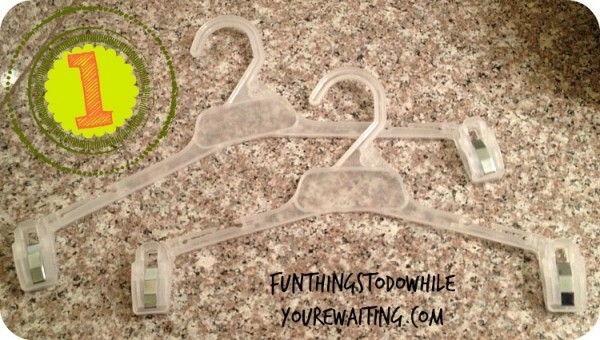 So, next time you find yourself with some cheap, plastic hangers figure out what else you can do with them before you toss them! Do you loathe swimsuit shopping? Have you been to Panorama City? As always, let us know what you think! Thank you for reading! *Behold an exclusive “safety goggle” photo from behind the scenes of the FTTDWYW Pin-Test lab. Previous Article← Zucchini Lasagna- Sneak Attack!